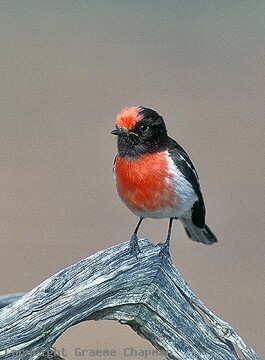 The Red-capped Robin is the robin redbreast of the inland and occurs widely throughout dry woodlands and scrubby country over the southern two-thirds of Australia (roughly south of 20 degrees). 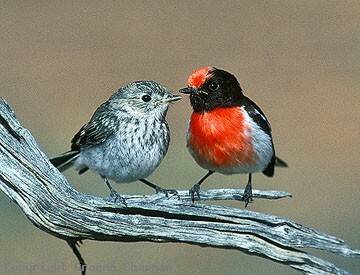 In the good times, Red-capped Robins are common and the brilliant males are a feature of the countryside. 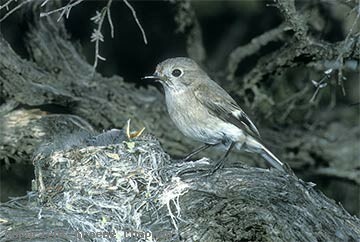 Not at all shy, they are easy to observe as they flit from perch to perch, usually fairly low down as they feed mainly from the ground. 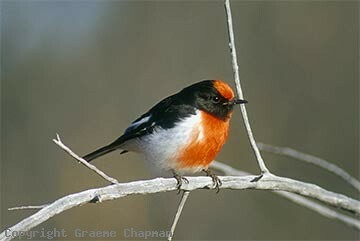 Over the years, I have found that the presence or absence of Red-capped Robins is a good indicator of the health of the countryside - in poor seasons you won't see many and even if you do, the breeding males will be yearlings, still in their brown immature plumage. 381201 ... Red-capped Robin, male and fledgeling. 381203 ... Red-capped Robin, female.